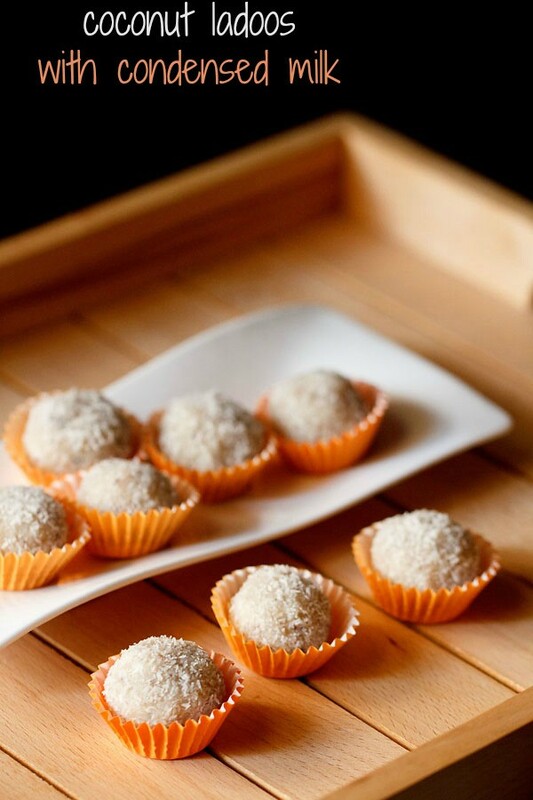 boondi ladoo is a popular indian sweet made from gram flour batter. boondi ladoo recipe with step by step photos – a delicious and popular indian sweet made from besan (gram flour) batter. these ladoos are called boondi ladoos, since the batter is poured through a ladle or sieve with perforations while frying. 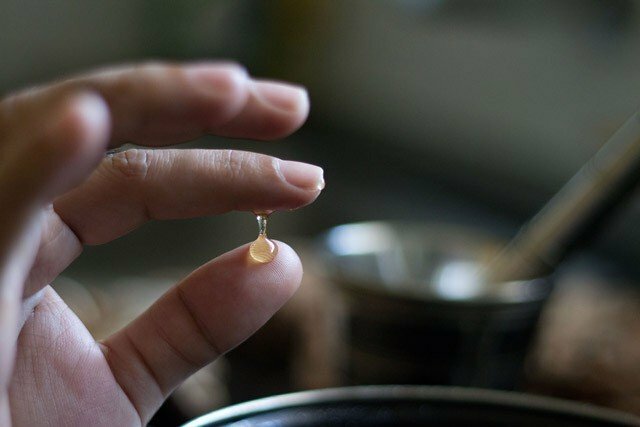 these give rise to round shaped droplets, called as boondi (derived from the word ‘boond’ in hindi which means water droplets). there are two types of boondi ladoos. one is a soft textured one and the other is a crisp hard one. both these ladoos have some variations in the method and the consistency of sugar syrup, thus yielding different textures. 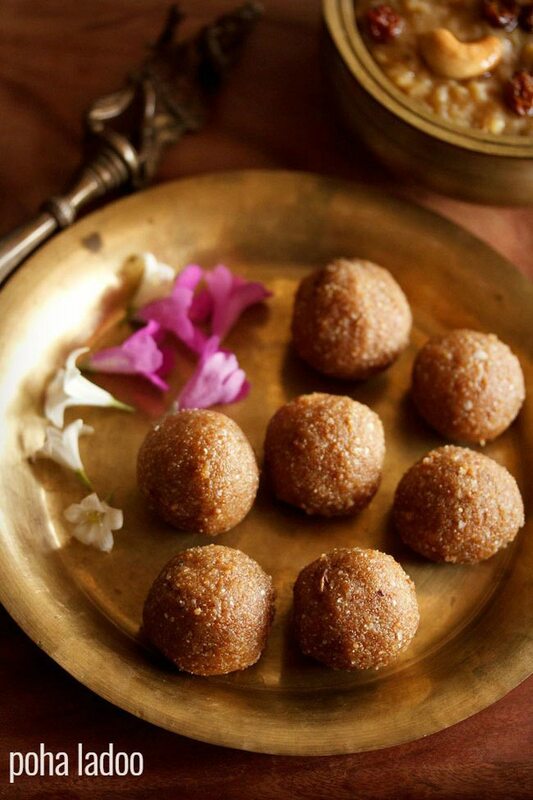 this recipe give a soft textured boondi ladoos. 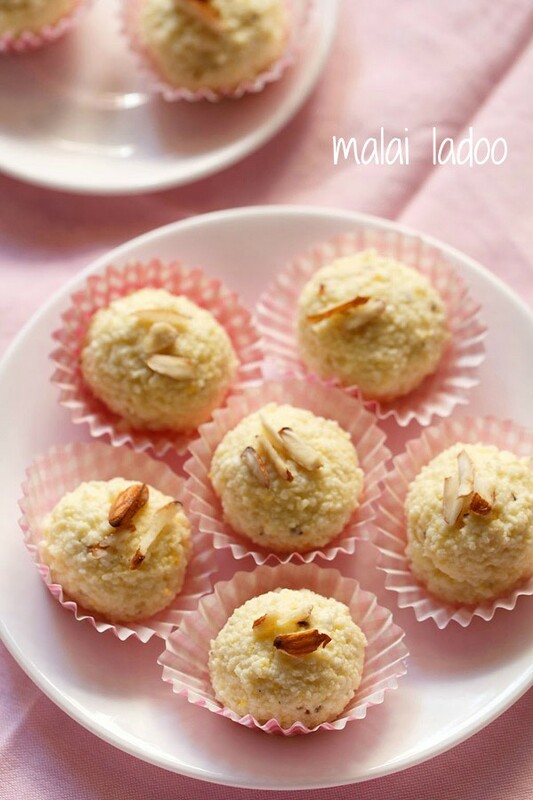 the method to make boondi ladoo is similar to making motichoor ladoos. just remember that the consistency of the batter should be right, to get round shaped boondis. also, if you can and if you have the means, use a boondi ladle (an equipment meant for specially making boondis) to make the boondis. round or not so round boondis, but they taste good and get over soon. store the boondi laddu in an air tight jar once done and they stay good for a couple of days. to keep for a longer time, about a week in the refrigerator. you can also fry the boondis in ghee instead of oil. hopefully, for ganesh chaturthi, i plan to make ganesha’s naivedyam tomorrow and if possible also plan to post them. i pray that lord ganesha gives me the energy and creativity to do so. wishing all who celebrate a happy ganesh chaturthi and may lord ganesha bestow peace, prosperity and wisdom on all. 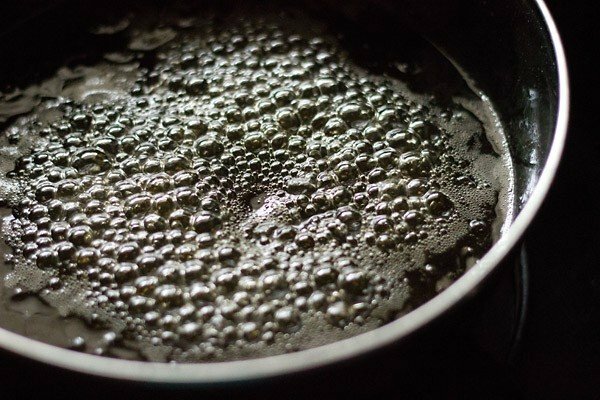 mix sugar and water in a pan. keep the sugar solution on stove top on a low heat. cook the sugar syrup, till you get a one thread consistency. switch off the flame. keep the sugar solution aside. the sugar syrup should be hot when you add the boondis. so you can keep the sugar solution on a hot water bath. meaning place the pan on a plate or tray filled with hot water. you can fry the boondis and prepare the sugar solution side by side. thats what i did. take all the dry ingredients for the boondi batter in a mixing bowl - besan/gram flour & saffron powder. add water to make a smooth batter. 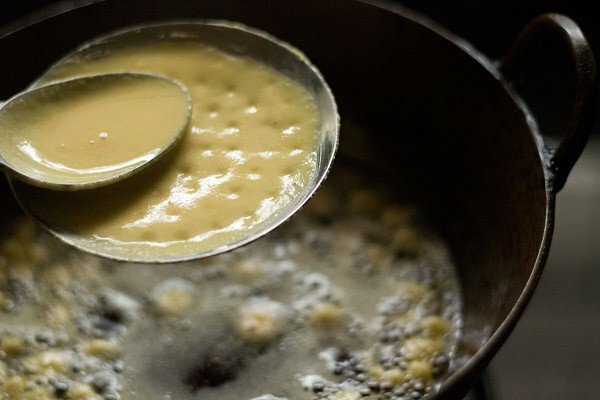 the consistency of the batter is important. we will check if the consistency is right, by frying a few boondis. 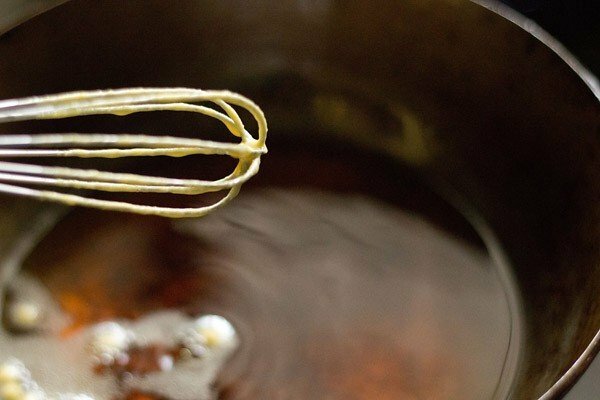 tap the wired whisk or the handle of a spoon which has a bit of batter in to the hot oil. the boondis should have a round shape. if they become flat, the batter is thin and if they get tail ends, the batter is thick. if thin, then add a bit of gram flour and check by frying a few boondis. if thick, then add a bit of water and then do the same test. once you get the correct consistency, proceed with the next step of frying the boondis. 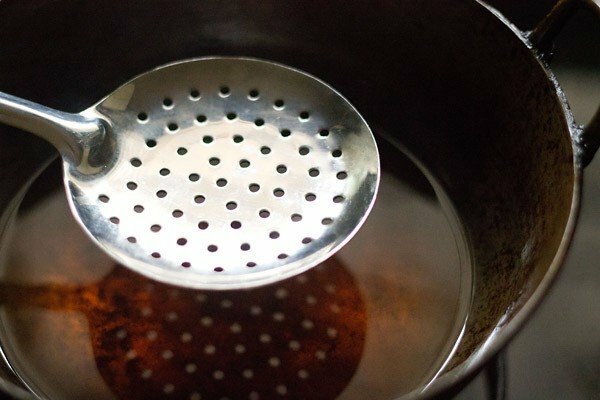 take a dry perforated ladle and place it above the hot oil. don't keep too much on a height, as the batter droplets, when falling from a height, do not give a round shape. with a spoon add some batter on the perforated spoon ladle. spread the batter lightly with a spoon. finish up the batter on the perforated spoon ladle this way. fry the boondis till they are cooked. don't make them crisp or over do the frying. when the oil stops sizzling, remove the boondis. this step is also important because if boondis becomes crisp then the boondi ladoos won’t be soft and they won’t be able to absorb the sugar syrup. after each batch, wipe the perforated ladle with a clean piece of kitchen towel from both sides. 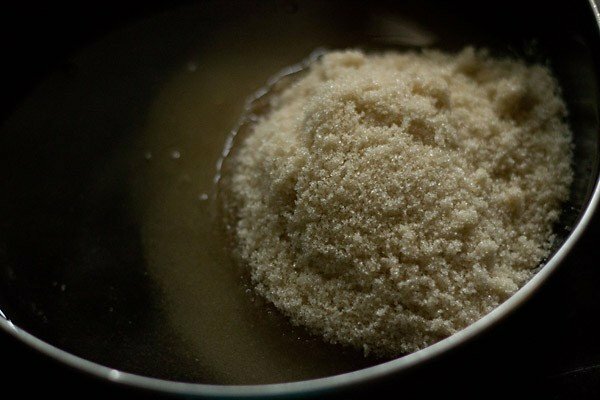 strain the fried boodi well with a slotted spoon and then add them directly to the hot sugar syrup. fry all the boondis with the above method and then add them to the sugar syrup. finally add a melon seeds (magaz), cardamom powder, black cardamon seeds, ghee and a pinch of edible camphor (optional). 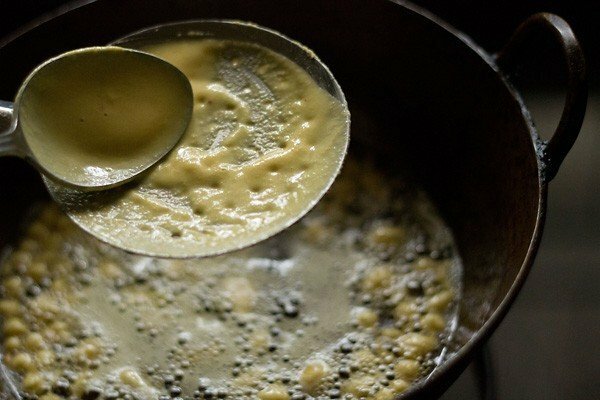 ghee helps in binding the boondi ladoos. i added about 1 tbsp of ghee later. you can place the boondi ladoos in a small muffin liners. 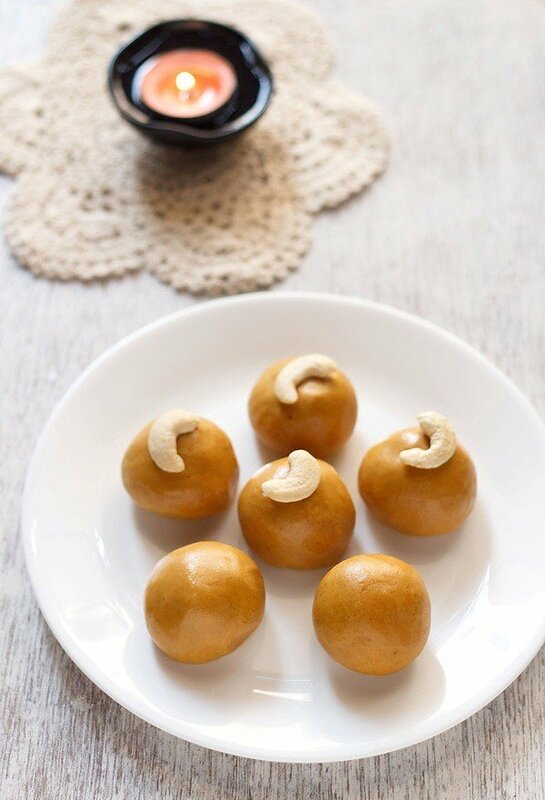 you can also garnish the boondi laddu with raisins or cashews. serve the boondi ladoo to lord ganesha. 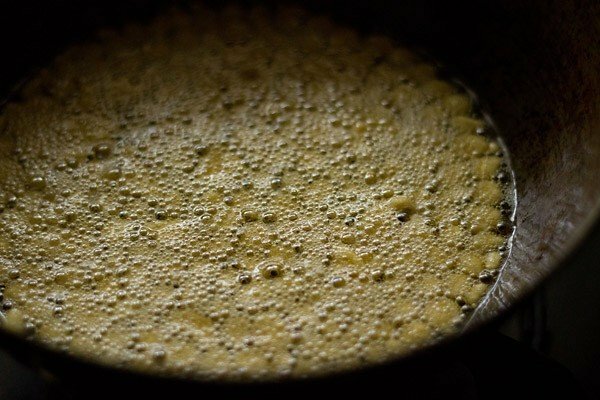 2. add water to make a smooth batter. the consistency of the batter is important. we will check if the consistency is right, by frying a few boondis. 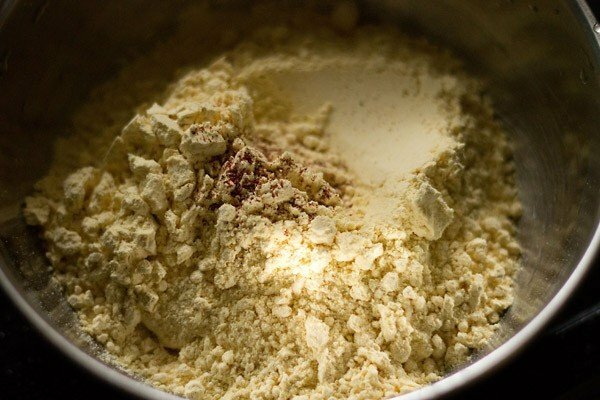 the amount of water to be added depends on the quality of gram flour. 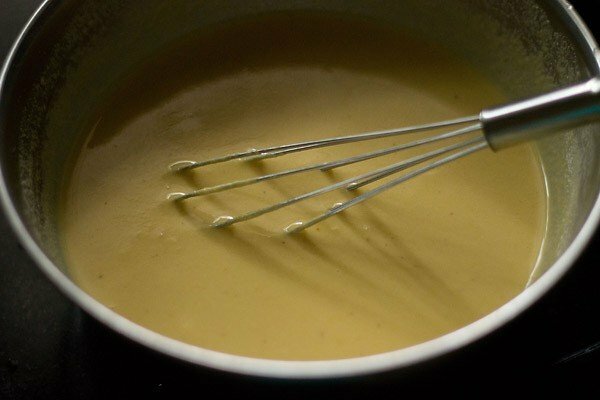 3. tap the wired whisk or the handle of a spoon which has a bit of batter in to the hot oil. 4. the boondis should have a round shape. if they become flat, the batter is thin and if they get tail ends, the batter is thick. if thin, then add a bit of gram flour and check by frying a few boondis. if thick, then add a bit of water and then do the same test. once you get the correct consistency, proceed with the next step of frying the boondis. 5. meanwhile, mix sugar and water in a pan. 6. keep the sugar solution on stove top on a low heat. 7. cook the sugar syrup, till you get a one thread consistency. switch off the flame. keep the sugar solution aside. the sugar syrup should be hot when you add the boondis. so you can keep the sugar solution on a hot water bath. meaning place the pan on a plate or tray filled with hot water. 8. you can fry the boondis and prepare the sugar solution side by side. thats what i did. take a dry perforated ladle/jhara and place it above the hot oil. don’t keep too much on a height, as the batter droplets, when falling from a height, do not give a round shape. 9. with a spoon add some batter on the perforated spoon ladle/jhara. 10. spread the batter lightly with a spoon. finish up the batter on the perforated spoon ladle this way. 11. fry the boondis till they are cooked. don’t make them crisp or over do the frying. when the oil stops sizzling, remove the boondis. this step is also important because if boondis becomes crisp then the ladoos won’t be soft and they won’t be able to absorb the sugar syrup. 12. after each batch, wipe the perforated ladle/jhara with a clean piece of thin cotton kitchen towel from both sides. 13. strain the boondis well with a slotted spoon and then add them directly to the hot sugar syrup. fry all the boondis with the above method and then add them to the sugar syrup. 14. finally add a melon seeds (magaz), cardamom powder, black cardamon seeds and a pinch of edible camphor (optional). add ghee also. 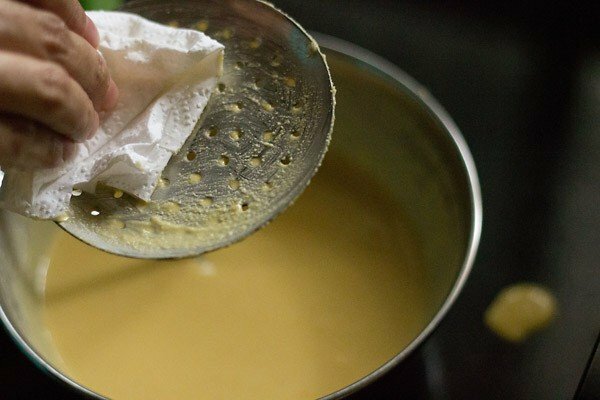 ghee helps in binding the ladoos. i added about ¾ tbsp of ghee later. 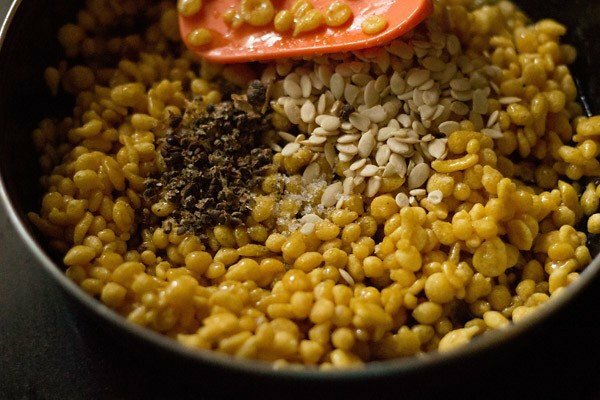 13. mix well and shape the boondi mixture into laddos. 14. you can place the boondi ladoo in small muffin liners. 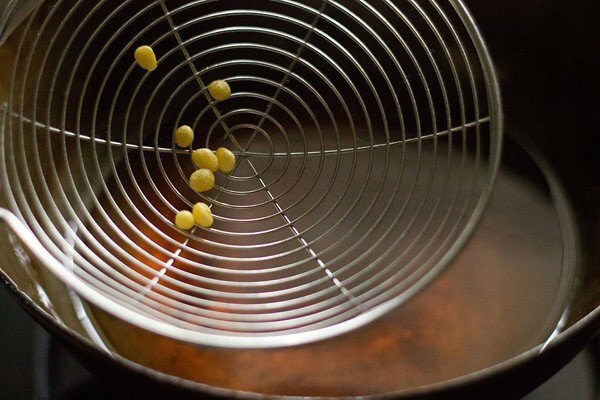 you can also garnish the boondi ladoo with raisins or cashews. 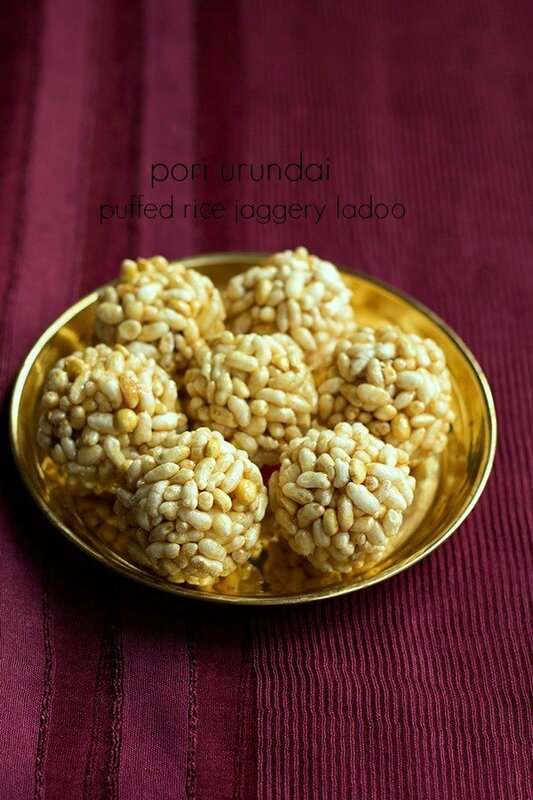 serve the boondi ladoo as naivedyam or bhog to lord ganesha. note: if you want to make any food for deities then please refrain from tasting or smelling it. also make it with lot of devotion, cleanliness and peaceful state of mind. 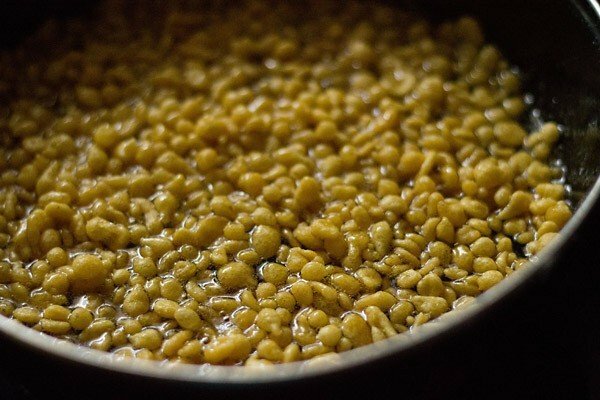 I love your recepies n they have made believe that I can serve good too… N this Diwali you are the inspiration for me attempting to make my son’s favourite boondi laddo …I would like to know for how long do these stay fresh …the shop ones go bad in few days. thanks madhura. 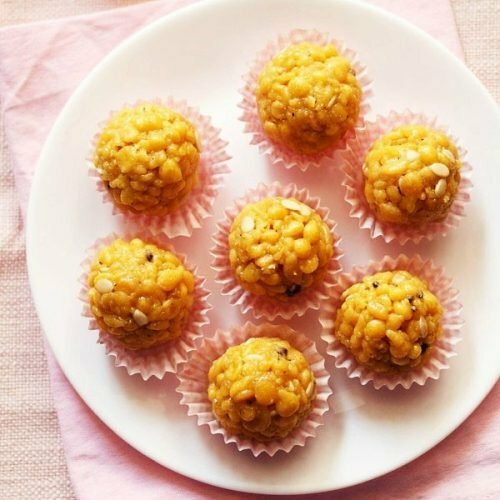 boondi ladoo stay good for a week in a cool or cold climate. 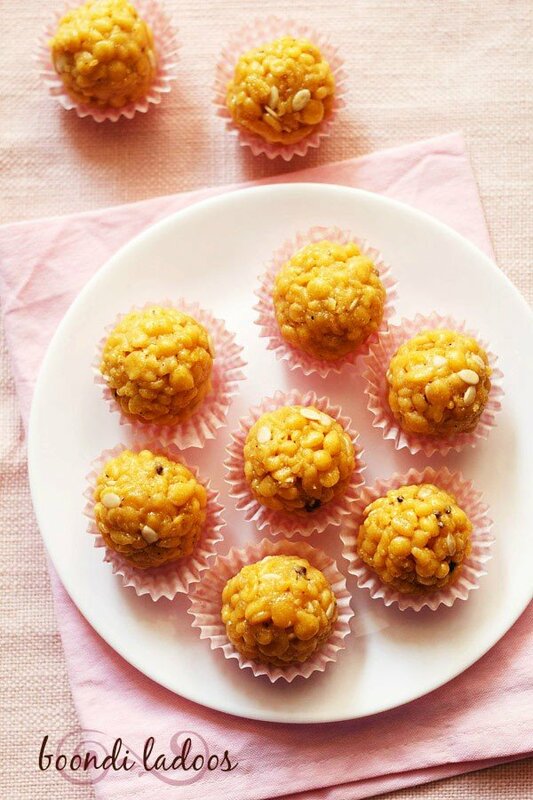 but in a warm and hot climate, i would suggest to keep boondi laddu in the fridge. This ladoo recipe is very easy and tasty. I tried making these ladduoos as my son loves them. It turned out to be so yummy much tastier than the store bought. Thank you so much for sharing the receipe. Welcome Salitha. 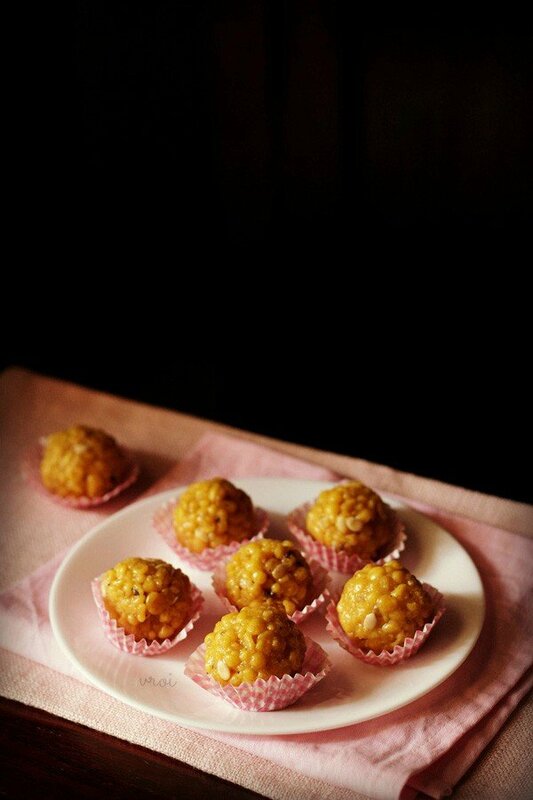 Glad to know that you liked boondi ladoo recipe. I tried your recipe and it came out PERFECT! It was my second time. My first time I tried some other recipe and it was a disaster. I didn’t know how to fix the issues, which you explain so well. It was easy and fun. Thank you! Welcome Uma. Glad to know that details in the boondi ladoo recipe helped you. 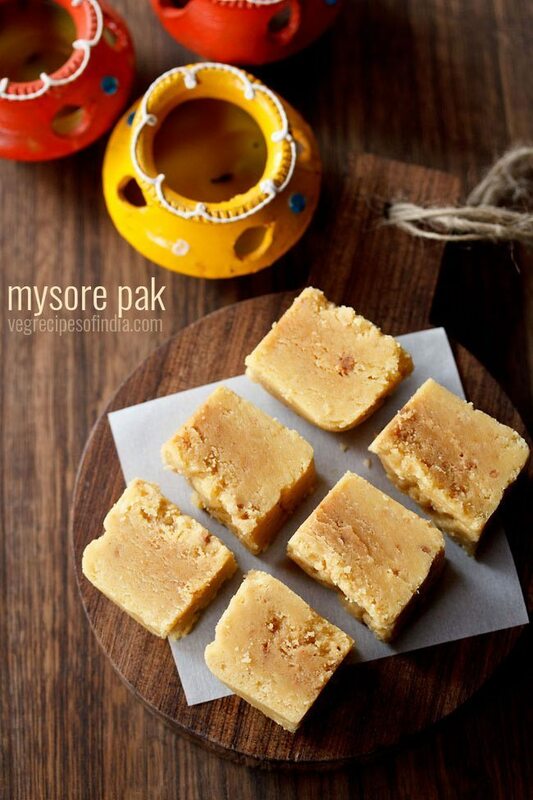 Its a slightly tricky to make these ladoo but once you get the knack then they are easy to make. of course fool proof recipe helps a lot. I just made this and it came out perfect! 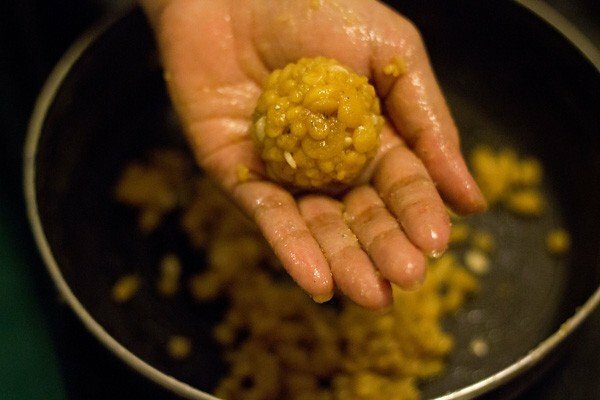 🙂 This was my second time trying bundi laddu and I gained a lot of confidence from your simple instructions about how to check for batter consistency and how to fix the issues. My first time, I tried some other recipe, it had no instructions about what to do if bundis don’t come out ok. My mother said to me, it’s not worth making, don’t waste your time. But I paid no attention to her, I just made it and it came out PERFECT! THANK YOU!